Sponsored by: PEOPLE OF U.A.E & Eenadu. Village Khavda is located 70 Kms away from Bhuj. The village is crucially important for India as Khavda is strategically located on India-Pakistan border. On 26th Jan 2001, when the earthquake of Richter scale 7.9 struck, over 70 % of the village was destroyed. The residents are a mixed group of communities including the Thakkars who are known for their courage and patriotism. They would have been forced to migrate, if timely help had not reached them. BAPS had distributed relief supplies to every house in Khavda, irrespective of caste, creed or community. 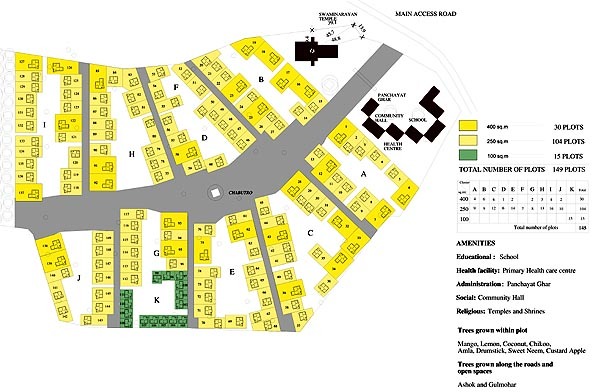 Later, to accommodate the affected families that had not been adopted by other NGOs, BAPS erected a Tent-city in the initial months and later a Tin-city to house them. Though the Army, the Government of Gujarat and local authorities were desperate to help BAPS acquire appropriate land to construct a colony of 155 houses for the affected people, land allocation procedures took a very long time. Ultimately, the concerned land was officially acquired by the Government on 27.04.2002, Saturday and handed over to BAPS for construction. In just two days, Foundation-stone Laying Ceremony on the chosen land was performed on Monday, 29.04.2002 at 9.00 a.m. Plans were prepared and models were made at short notice. The ceremony was conducted in the presence of a thousand people including BAPS sadhus from various places, invited guests, residents and neighboring village folks. EENADU group from Hyderabad and PEOPLE of U.A.E. were the two chief donors for the project to house 155 families. EENADU group had sent a delegation of three executives, Mr. K.S.N.Murthy, Mr.Nageshwar Rao and Mr. D. Prasad who attended the ceremony. Deputy Collector, Mr. Galchar was also present. The ceremonies began at 9.00 a.m. with Mahapuja of Bhagwan Shri Swaminarayan by Pujya Doctor Swami and Pujya Devcharan Swami. The guests along with the leading citizens of Khavda took part in this hour long ceremony which concluded with the Foundation-stone Laying. Addressing the assembly, Pujya Doctor Swami conveyed that the local people are the guardians of our border and hence very important to the country and that they should supported and strengthened. He also conveyed that it is very important to live and lead a pious and pure life, always remembering to worship God in whomever they have faith. The delegates from Eenadu, Mr. D. N. Prasad, Mr. Murthy and Dr. Nageswar Rao spoke in English, thanking their Chairman, Mr. Ramoji Rao for generosity, praising BAPS for its wonderful work and reaching out to the people of Khavda. Pujya Brahmavihari Swami translated the letter from Bharat Shah and Ashok Kotecha on behalf of the PEOPLE OF U.A.E., which expressed their prayers and good wishes. The beneficiaries, the Khavda residents, expressed thanks to them by remembering Bharat Shah and his team when they had come in the early days after the quake. On this occasion, HDH Pramukh Swami Maharaj had blessed the people for peace and prosperity. Pujya Sidhdheshwar Swami had the pleasure of reading this letter of Blessings. Pujya Doctor Swami honored the invited guests from the EENADU Team, the architect of the project Mr. Yatin Pandya and his team, and Mr. JADAVJI Thakkar, president of the community by offering them beautiful shawls. The ceremony was completed after this, with each individual resident being happy to be associated with and being part of BAPS.